Una ciudad hermosa casa amueblada y confortable, situado en el prestigioso Paseo President`s a Truman anexo. El primer piso incluye un porche cubierto, sala de estar, área de comedor, cocina totalmente equipada y baño completo. El área de descanso incluye una cómoda mesa de centro y una silla, pero está dispuesta para mantener el plano de planta abierto. La hermosa mesa de comedor de madera es un lugar perfecto para comer, jugar a las cartas o extender su oficina en caso de que tenga que traer trabajo con usted. El segundo piso está equipado con el dormitorio principal que se adapta a la cómoda cama tamaño king, un baño completo con ducha y la habitación para huéspedes con dos camas individuales que pueden convertirse en una cama king previa solicitud. Relájese en el patio en la bañera de hidromasaje o tome las bicicletas para dar un giro. La parrilla está lista para cocinar su pescado fresco y luego cenar afuera bajo el paraguas entre las palmas. La piscina comunitaria climatizada se encuentra a pocos pasos de la casa y esta ubicación del casco antiguo es conveniente para la calle Duval, las puestas de sol frente al mar en Mallory Square y la mejor playa de Fort Zachary Taylor. También está a poca distancia de Fausto`s (pequeño supermercado con cerveza / vino) CVS, y Walgreen`s. This was our 5th trip to Key West and our 3rd stay in the Truman Annex. It is the perfect location. The property was exactly as advertised and very clean. Does the property need some upgrades? Sure, but it is obvious that things have been updated so I am sure it is a work in progress. My one suggestion would be to add baskets to the bikes. We would have used the bikes available but a basket is a must so we needed to rent. Brian, the property manager is awesome! The information provided prior to arrival was detailed and he is very responsive to any questions. The location could not be better. Located in the Truman Annex right downtown, but not on a busy street. The condo had everything we needed for a long stay. Hot tubs, bikes, washer dryer and a nice deck out back. The community swimming pool was great. A very short walk to everything downtown. We had a wonderful time during our month long stay at Dancing Palms! The house was lovely and well kept. The staff very accommodating and kept in touch to check on everything. It's such a great location being close to the State Park and the harbor! We will look forward to our visit next year. Overall Dancing Palms in my view gets a 3.5 rating. It could use some TLC. For example, the upstairs bath is dated with cracked floor tiles, a very low vanity and toilet ala 1970s. The upstairs shower only produced moderately hot water while the downstairs bath (modern and lovely) wouldn&#x2019;t let you have any cold water. The cushions on the patio and front porch furniture need to be replaced. Two bikes are provided but both fit a small/medium height person; we had to rent a bike for a 6&#x2019; guest.The kitchen is equipped with a mishmash of pans some of which need to be replaced. Ditto some of the plastic cups. The property manager Brian Yoest was extremely responsive. It was a rainy season in Key West and we had some ongoing bug issues which Brian came out twice to spray for. Dancing palms was the perfect rental for my family. In a charming gated community, it was comfortable, quiet and well equipped. Perfectly located for all we wanted to do, we were able to fully enjoy Keywest. Duval Street is just 2 blocks away with easy access to all the shops and restaurants. Beautiful Zachary Taylor State Park was a short 10 minute walk from this property. We loved the bikes and outdoor space. The communication from Brian, the property manager was helpful and it was so nice to know we could contact him if we needed anything. Thank you for your wonderful 5 star review on Dancing Palms. 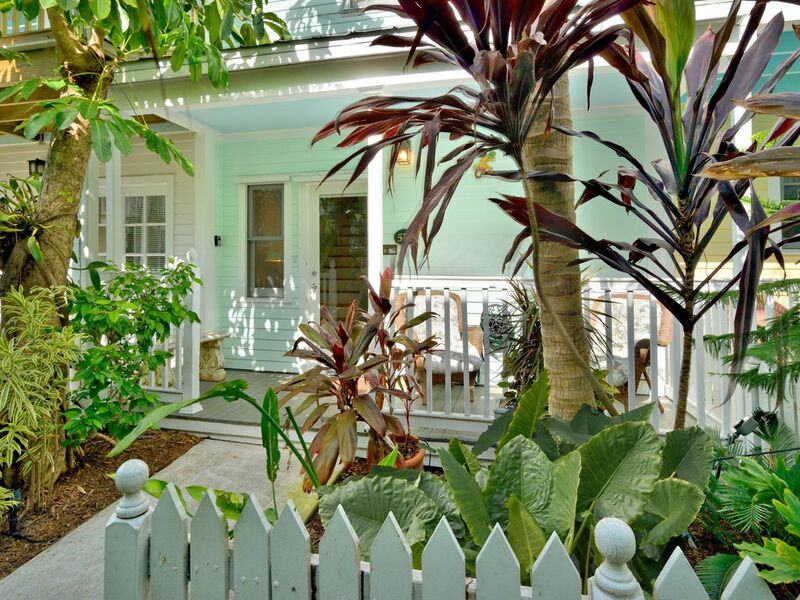 We are so thrilled to hear how perfect this rental was for your Key West visit. The community is very charming and extremely convenient being just a couple blocks off Duval. We loved having you as our guest and hope you come back and see us soon! Dancing Palms was a perfect fit for my family. Located in a charming gated community, it was super quiet and safe. A short two blocks from Duval Street where all the action is, we loved walking everywhere. The rental agency and property manager Brian were helpful and professional. Highly recommend!